Do you want to learn more about sustainability and the environment? Now is your chance during the Wyndham Learning Festival. Bring a friend or come along by yourself and learn something new while meeting new people. 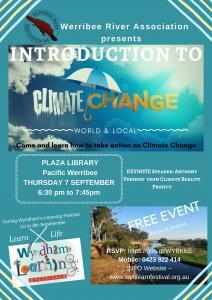 The Werribee River Association presents ‘Introduction to Climate Change’. The Keynote speaker will be Anthony Verhoef from the Climate Reality Project. Come and learn more about the climate and what we can do as citizens to get involved. A fantastic free community learning event. For more details click here. Spring into learning this Spring 1-8 September!